I LOVE any reason to gather friends together for a little crafting party!! As Room Mom this year for our youngest son’s classroom, I was tasked with organizing gifts throughout the year for teachers. One of the most requested gift items each and every year from teachers is a gift card. So, I do my very best to come up with a personalized spin for how we present gift cards to our teachers. For Valentine’s Day this year, we gathered together to create a variety of handmade cards using simple hearts punched from card stock. 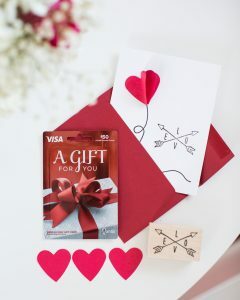 These handmade Valentine’s Day cards were the perfect way to dress up our Vanilla Gift Cards. We are sharing some simple ideas below for hosting your own Galentine’s Day card making party!! For our Galentine’s Day party, we chose simple, Valentine’s Day decorations. A simple pink & white floral arrangement was the perfect centerpiece for our crafting table. 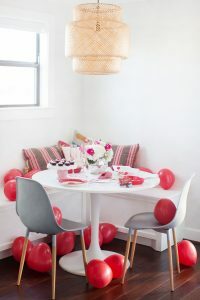 Red heart balloons were scattered across the floor for some added whimsy. 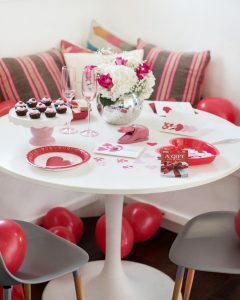 Our craft supplies were displayed in red heart shaped shallow bowls, doubling as decor. And, we served simple heart shaped treats on a pink and white pedestal. When hosting a craft party, keep the decorations minimal and focus on gathering the supplies needed for your projects. Whenever hosting a craft party, I like to choose a few simple concepts that guests can create. 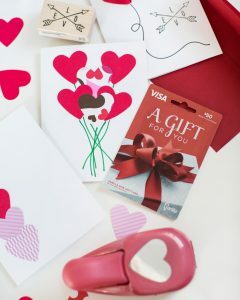 For our DIY Valentine’s Day cards, I created 3 inspiration samples using only a few craft supplies. I LOVE how simple, yet pretty these handmade cards turned out by rearranging simple hearts cut using a 2″ heart craft punch. A heart bouquet with a cluster of heart cut outs, then a bunch of ‘stems’ at the base of the design using a green permanent marker. A simple 3D heart balloon, created by piecing together 3 heart cut outs using glue and then adding a simple balloon sting using a black permanent marker. A Valentine sentiment stamp was added to the side of the card using black ink. A modern, yet simple design with a stack of heart cut outs positioned to one side of the card. Design ideas are literally endless for what you could create, so be creative with your DIY cards!! Create an assortment of pre-punched hearts using a craft punch. We used a single size for our projects, but a variation of heart sizes, shapes and designs would also be fun! 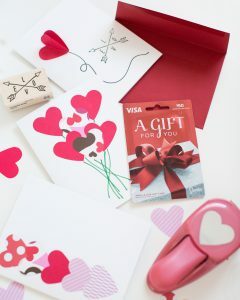 Gather the other items needed to create the cards and display in Valentine’s Day boxes or bowls at your crafting area. 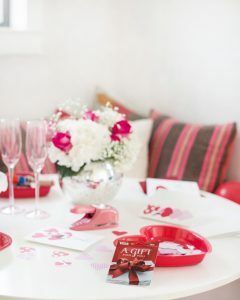 Create sample cards for Galentine’s Day party guests to use as inspiration. Our handmade Valentine’s Day cards were a great way to present Vanilla Gift Cards to our classroom’s teachers. You can find Vanilla Gift Cards at your local CVS, Walgreens, Rite Aid, H-E-B, Family Dollar, Dollar General, Sam’s Club or Walmart. Happy Valentine’s Day! !